Extremely versatile, you can hang them on the wall as a sleek backdrop for original artwork. Or use them to hang tools and equipment as you would pegboard — with much more attractive results. For a supremely impressive presentation, select one of three styles of Slatwall Stands, all with different panel configurations to suit any taste or need. Testrite Slatwall Panels feature an etched satin finish and 1" on-center construction. Coordinating Picture Hooks are sold separately in a package of 24. Market Stand — Made to withstand the rigors of temporary outdoor art shows and flea markets, this stand breaks down for easy portability. 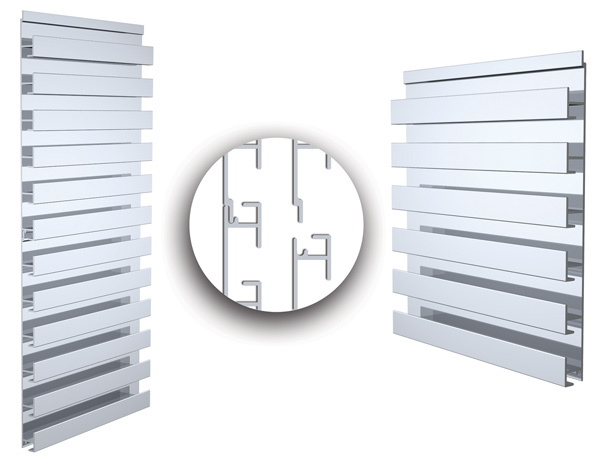 It includes eight 60"W × 6"H Slatwall sections, which nest together and can be moved up or down and faced to either side so you can customize your presentation. Casters are not included. Gallery Stand — Suitable for upscale use in galleries and tradeshows, this stand is equipped with lockable rolling casters and stylish satin aluminum adjusting pucks. It includes eight 60"W × 6"H Slatwall sections, which nest together and can be moved up or down and faced to either side so you can customize your presentation. Slatwall Stands — These portable stands are lightweight and strong, featuring welded steel bases and locking casters. Choose from Single-Sided or Double-Sided designs, with or without a header panel that accepts 22"W × 8"H graphics.